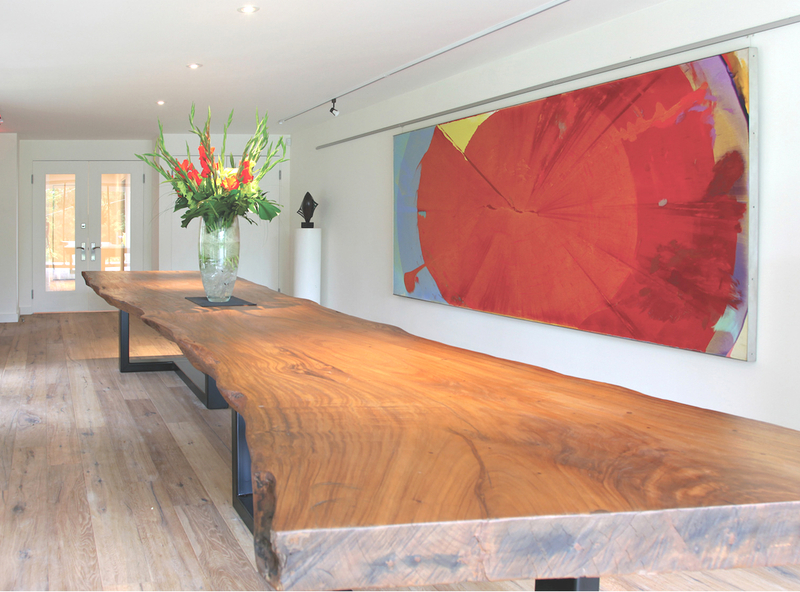 The focal point of the Gallery Room is the majestic 18-foot, 1300 lb (half-ton) solid slab hardwood table made from Indonesian hardwood. The wood is a tropical hardwood known as Kayu Meh; Kayu means wood in Indonesia and Meh is the species of tree. It is not cut from the rainforest but rather grows very fast and is found on small farms and in villages much like a Maple tree in Canada. This impressive table seats 20 people comfortably and is ideal for a private dinner or corporate meeting. The artwork found on the inside 13th Street Winery is rotated throughout the year and features original works by various Canadian artists. 13th Street is proud to have had the opportunity to display works from the following artists: Michael Adamso, Gary Blundell, Ronald Boaks, David Bolduc, Nicole Katsura, Joseph Drapell, William Ronald, Floyd Elzinga, Sarah Phelps, and Dan Solomon. We are also thrilled to have a collection of permanent sculptures on the property by Karoly Veress, Floyd Elzinga, Dan Soloman, and Ilan Averbuch. If you are looking for a unique location for your next corporate function or private dinner party, look no further than 13th Street Winery. The Gallery Room is ideal for small groups looking for an intimate and secluded venue for meetings or private dinners. We work with a number of renowned local chefs with a flair for utilizing local produce in their culinary masterpieces. Whether you are looking for a location for a working lunch meeting, an after-hours social venue or private dining room for a formal sit down dinner, 13th Street’s contemporary farmhouse is the perfect blend of relaxing country ambiance and understated elegance. Combine this with our award-winning wines and superb cuisine and you have the makings of an unforgettable gathering. To request information on hosting your own event at 13th Street Winery click here.